A newly released image of Saturn's moon Epimetheus shows eons of collisions and nothing to erase them. It's a hard-knock life for Saturn's moon Epimetheus. The pale-gray moon, which NASA's website describes as "potato-shaped," is covered in craters from eons of merciless collisions with space debris. Several of these craters are larger than than one-quarter the diameter of the moon itself, according to NASA. In a newly released, high-resolution image of Epimetheus captured by the Cassini space probe on Feb. 21, this little moon gets a moment in the spotlight. In the photograph, Epimetheus emerges from deep, inky blackness, its surface decorated with gray polka-dots. 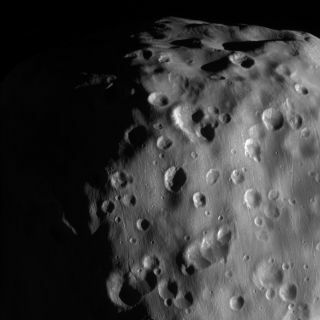 Epimetheus is about 70 miles (113 kilometers) across. Several craters on its surface are larger than 19 miles wide (30 km). The image shows the side of Epimetheus facing away from Saturn, at a distance of approximately 9,300 miles (15,000 km). The moon is too small to have an atmosphere, which must be held in place by gravity; nor does it have internal geologic activity. Without those factors, there is nothing to erase the craters that speckle the moon's surface. A map of Saturn's moons and its ring system. Epimetheus' orbit around Saturn is unique in the solar system. This small moon shares an orbit with another moon of Saturn, called Janus. One moon orbits 31 miles (50 km) closer to Saturn than the other. When the two moons catch up to each other in their orbit, the gravitational interaction causes the moons to switch places. This do-si-do takes place about every four Earth years, according to NASA, although the closest the moons ever get to each other is about 6,200 miles (10,000 km). There is no other similar arrangement know in the solar system. The Cassini probe has already begun a series of maneuvers that will eventually send it hurtling straight down through Saturn's atmosphere. This death plunge will give scientists a close look at parts of the ringed planet that orbiting spacecraft cannot reach. Follow @callacofield on Twitter. Follow us @Spacedotcom, Facebook and Google+. Original article on Space.com.